Don't forget today's total solar eclipse! You can read more about it in the NASA Solar Eclipse website or in the Wikipedia article. You can also watch the solar eclipse online here (NASA) here (in Chinese). 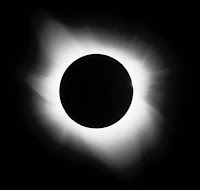 Here in Thailand the eclipse will be a partial solar eclipse visible early evening. Too bad it's a cloudy day today. Later... It rained! Wahhhh! The NASA webcast is now archived here and there's a YouTube video of the event here.